The celebration of Biafran Day in memory of Late Dim Chukwuemeka Odumegwu Ojukwu turned sour Monday in Anambra, as the military, police, members of Indigenous People of Biafra (IPOB) clashed, killing over 30 persons and injuring many. 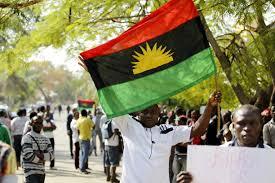 According to The Nation, over 50 members of the Biafran group were arrested by the military and taking to their 302 cantonment in Onitsha. Following the mayhem, the commercial city of Onitsha especially Nkpor axis, was locked down with the security operatives taking over the roads. Commercial activities were paralyzed as a result, with vehicular movements stopped with burn fires all over the roads. Speaking with reporters Monday on the development, the public relations officer (PRO) of (IPOB), Emma Powerful, alleged that security operatives had killed over 30 members of the group, over 50 others arrested and taken to an unknown destination. Also, he alleged that many others were seriously injured in the mayhem, adding that the security operatives started arresting their members since 1.30 am when they began their peaceful demonstration. According to him, “they were moving around in their hilux vehicle with a native doctor, when we are celebrating Biafra without any form of weapon, does it mean that we have no right for our fundamental rights,” Emma asked. When the Police Public Relations Officer (PPRO), in the state Ali Okechukwu was contacted yesterday at about11.55am, he said there was no room to discuss causality figures, adding that they were still busy trying to clear the roads for easy movement.